Finnish multi-media artist Jan Anderzén under his Tomutonttu guise. Kevätjuhla is his second release for Alter following a split 7" with Oneohtrix Point Never in 2010 (ALT 002EP), and his first vinyl long player since 2011. Lately, Jan has been creating installation work for which the music of Kevätjuhla was initially composed. Inspired by the multitudes of mold and the microbial life, the installation Kevätjuhla was built as a listening station that sought a bond between sound, the earth, and organic matter. Sound was sent to speakers through cables, sprouting like stems from a pile of dirt with a single coleus growing on top. 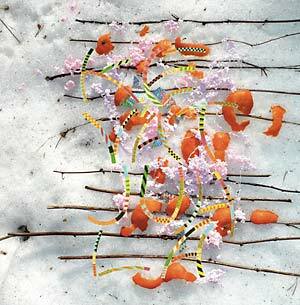 A graphic score of sticks, orange peel, and party debris were hung next to the installation. The score is visualized on the albums cover. Electronic and acoustic instrumentation blends together confidently and more refined than before with a minimal, razor sharp approach to production. Each track is an integral part of the record's trippy cut-and-paste narrative, leaving the listener wholly unaware when one bit ends and another begins. A confounding array of musical references, such as folk, hip-hop and Yellow Magic Orchestra could be thrown up here, but with Kevätjuhla, Anderzén has ultimately created a form of music that goes beyond genre classification and fully into the realm of "other".